If Free Practice was any predictor, qualifying looked set to be dramatic – and as always, Formula E delivered. 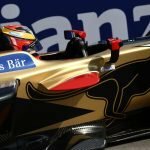 Jean-Eric Vergne took pole, in a chaotic session that saw a crash in almost every group – and two in Super Pole. A strong-looking group, including Evans whose qualifying pace this season has been blistering – and who was on to set a very fast time in FP2. However, the curse of Group One appears to have returned here, after being inverted in Marrakesh. Another highly competitive but disrupted group, the top five in the current championship standings are all fast qualifiers – in particular Vergne and Bird had topped the two free practice sessions here. Both set times good enough for Super Pole, although with Bird topping the timing sheet to this point with a 1:19.076 times were still slower than in the practice sessions. Edoardo Mortara was hoping to redeem mistakes in Marrakesh here but small mistakes on his lap cost him crucial time, as they did for Felix Rosenqvist, who uncharacteristically qualified well down the field. Extremely fast in FP2, Lynn looked possible for Super Pole from this group, getting into the top five. Which was almost the only lap of note from the championship midfielders, Turvey, Prost and Engel unable to set more competitive times. Lopez, outperforming teammate D’Ambrosio once more in the practice sessions, was fast for a Dragon car but unable to do better than what ended up P10 on timings, P9 after penalties are applied to other drivers, in what’s essentially his home race. With di Grassi setting competitive times in the morning sessions, this looked likely to be one of the stronger groups, despite being the championship trailers, points-wise. He managed to set the fastest time, beating Bird by a few tenths with a 1:19.053 – still nearly half a second slower than the fastest free practice laps. D’Ambrosio and Blomqvist, both struggling in slow cars, were unable to breach the top ten with their laps – and Luca Filippi, whose own team boss has said is finding Formula E difficult, span disastrously and recorded the lowest set time. 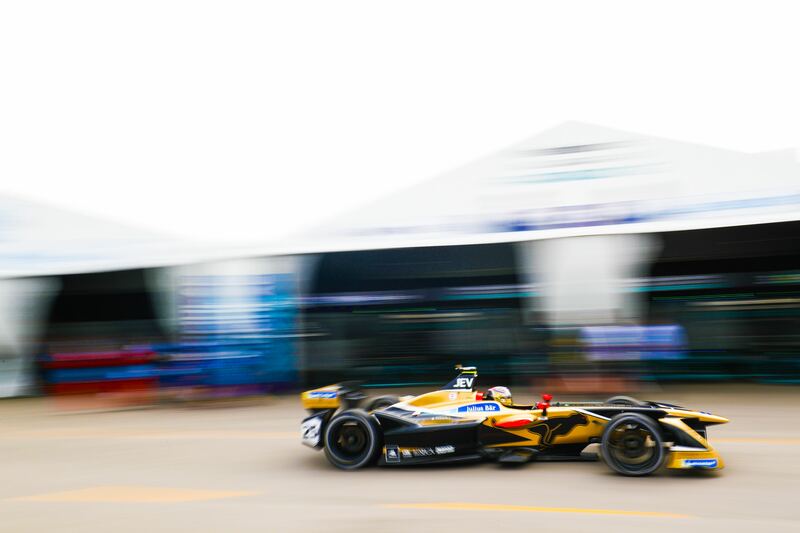 Andre Lotterer, however, who has up until now been struggling with a lack of manufacturer testing time for customer team Techeetah and the adaptation to Formula E’s technicalities, saw a sudden display of the form that’s made him a winner in every series he’s competed in. A near-perfect lap put him to the top of the timing sheets – and a double Super Pole entry for Techeetah – with a 1:18.796, over a second faster than his previous times today. Another session of surprise crashes, Sebastien Buemi went out first to set a respectable but un-pole-likely 1:19.355, bested by Jean-Eric Vergne’s 1:19.161. Bird, looking in with a chance of pole, span spectacularly and smashed the back of his car into the Tecpro barriers – he managed to drive back in it, which is good news for the team not needing a rebuild but meant the session was red flagged and he technically set no time. With Di Grassi’s penalty (10 grid places, for a replaced inverter) it still guaranteed him P4 but nothing better. 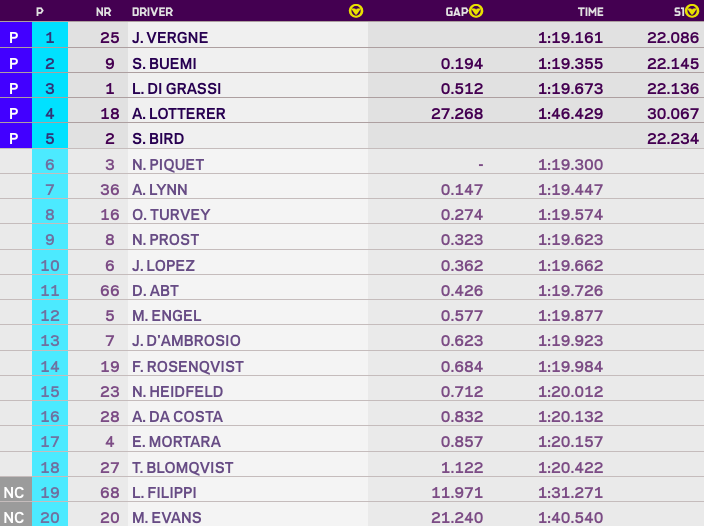 Di Grassi himself was unable to do better than a 1:19.673, putting him fifteenth after his penalty, leaving Lotterer as the only man to potentially beat his teammate. After his sudden turn of speed in group qualifying, it looked possible for Lotterer – until a mistake saw him hit the wall at Turn One, breaking the front wing and leaving him to nurse the car round, as the wing steadily slipped under the bodywork, in order to set a time and guarantee himself fourth, ahead of penalised di Grassi and Bird’s non-time. 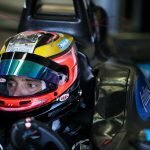 Vergne consequently takes the inaugural Santiago ePrix pole, with Sebastien Buemi next to him, Lotterer and Bird on the row behind and the top five on the grid rounded out by Piquet Jr.